Our team handles all the headaches of designing and building-out major renovations and new custom home construction while providing you a single point of contact and single source of responsibility throughout your entire project. This includes design, architectural plans, sourcing & receiving finish materials, contractor bidding and build management. The entire process is designer-led from initial concept to us handing you the keys to your new home. Unlike conventional contractor-led or architect-first approaches we create the optimal master-design to match your lifestyle and goals then carefully guard that vision throughout every twist, turn and step of the project. The result is a superior product built as-designed and delivered at the best possible value. Studio 818 is a full-service Design + Build Management firm led by husband & wife team John-Paul & Janie Micek. Located in Fort Lauderdale our firm works with residential and boutique commercial clients throughout South Florida. 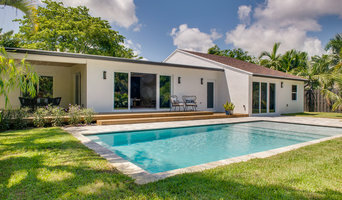 We are a South Florida based residential and commercial construction and remodeling firm, specialized in High-End renovation, that has been building extraordinary structures for many years. Our greatest assets are the level of craftsmanship, dedication and experience our team brings to each project. Sdh studio is a Miami-based design firm led by Stephanie Halfen. Founded in 2009, sdh is a young, innovative practice that focuses on the design of luxury homes throughout South Florida. With an ongoing search for the essence of design, a strong emphasis is placed on light, form and function. Sdh thrives to develop designs that encapsulate the heart and individuality of each client. The client’s vision of the project is a key component in the holistic approach to the design and development process. Sensitive to the particularities of each site, sdh is constantly searching for new creative ways to integrate the inside with the outside in order to create an intimate relationship between the user and its surroundings. Simple lines and expressive materials shape the palette for both the home’s exteriors and interiors. Understanding the fundamental nature of each material allows us to create inherent designs that establish a dialog between the architectural form and its environment. Follow us on Instagram @muse_design_studio and/or on Facebook at www.facebook.com/musedesignstudioFL We are a South Florida based high end design firm. 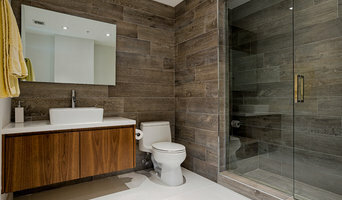 We specialize in residential interiors, including models and spec homes for builders. Schachne Architects & Builders, Inc. is a full service in house architecture, interior design and construction company specializing in custom homes, house additions, interior/exterior remodeling and commercial office design. The majority of our work is concentrated in Broward County, Florida. Over the past 24 years our clientele has appreciated the hard work, professionalism and dedication we commit to every project big or small. Our goal is to design and deliver innovative, cost-effective, energy efficient, high quality finished products that exceed expectations. WHY US? 1. 24 years of experience ensures the highest levels of customer satisfaction. 2. Client 24/7 access to documents, photos, information and communication with an online project management program 3. In house licensed architect and general contractor ensures fast turnaround time for changes with assurance of accuracy and accountability for structural integrity 4. Integration of design/estimating process reduces time required between design and construction commencement 5. Transparent project allowances insure budget transparency and peace of mind 6. Familiarity of local building departments and their staff, makes permitting, code and regulation compliance a smooth and seamless process 7. Time tested, licensed & insured subcontractors results in consistency and excellence in the quality of the finished product. 8. Longevity, 24 years in business ensures we will be around to service your warranty and questions that may arise. 9. Flexible options and product selections fulfills a broad spectrum of client design needs and goals. ONE DB is defining the future of design and building by enhancing the human experience through dynamic, program-driven build solutions. We are a boutique multidisciplinary office located in the MiMo District. A complete source for all interior design & furniture needs including Residential, Hospitality and Commercial. We own a local factory in Miami and have factory partners in the United States, Indonesia, Viet Nam, India, Philippines and China. We are full service design firm from custom furniture to general contractor. We have over 25 years of experience and can offer the best quality and service in the industry. Founded in 1954, when Fort Lauderdale was no more than a Mecca for tourists, “Howard Torn General Contractor” established a name within the construction industry. Specializing in speculative building, tract building and custom building, our construction projects have been a part of the tremendous growth that has taken place throughout South Florida for over the last 50 years. In 1983, as a result of that growth, Spiro Telegadis and Charles Mishner brought their varied talents to the team, and Howard Torn General Contractor became Howard Torn Construction Associates. In August of 1999, Howard Torn and Spiro Telegadis retired from the firm, leaving Charles Mishner as the current President and owner of the Company. Charles was mentored by two of the best construction professionals in South Florida, and as a result, the company’s legacy for refined, detail-oriented, quality construction lives on and is as successful as ever. More recently, our services have expanded beyond our previous horizons to include: multimillion dollar commercial-residential conversions, and large scale retrofitting projects, as well as, a variety of other services ranging from expert witness testimony to construction consulting and management. We look forward to what the future has in store as we continue to provide Florida with superior construction related service in all aspects of the industry. We are an Architecture and Construction company ... "Committed to creating useful and comfortable spaces" ... We have a multidisciplinary team trained in the different areas of Architecture, Urban Planning, Automation and Projects, allowing us to achieve an excellent level of optimization of details and quality of services in the management of each of our projects. Our competitive advantage: • Wide variety of products: Architecture, Interior Architecture, construction, remodeling, design, automation • We integrate different services in the same project. • Diverse market, we serve individuals and companies alike. • International reach, connection - networking. • Exceptional service and relationship with the client. • Proven Management. 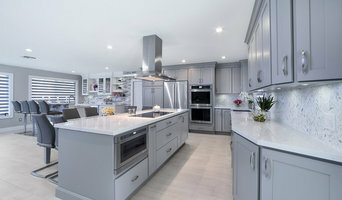 Nohmis Design & Construction is a family owned, fully licensed and insured design-build firm specializing in interior kitchen, bath and flooring renovations in the South Florida areas. You are in reliable hands with over 80 years combined construction and remodeling experience. We have a diverse team with competences in building, plumbing, electrical, engineering, architecture and interior design. We understand the design process and respect calculated details by building to specifications making our work safe and up to code. We have the ability to make calculated decisions on the fly saving you time. We have a full understanding of the work of our subcontractors and therefore avoid costly mistakes made by other trades saving you money. While building we are mindful for aesthetics and optimize the design by keeping options open during construction and thinking through building processes bringing into fruition your new beautiful home. Our mission is to bring comfort and luxury to your outdoor space while providing our clients with a custom design that fits their budget and needs. At Designer Patio we specialize in custom projects for outdoor kitchens, pergolas, pavers, artificial grass, pool & spas, and landscape design. Designer Patio is a family owned business that has over 15 years of experience in the construction, design, and landscaping field. Designer Patio is the source for consumers looking for quality, sophisticated outdoor work. We want to provide our clients with the best outdoor living environment and experience with our expert custom design, project management and outstanding installations. We have the products, people and process to help you create your dream outdoor environment. Our team is highly skilled and has years of experience. Most of all: they love planning, designing, and building and care about your project. We bring value to every interaction, and our customers love us. Get to know our experienced design and build teams. They’ve got tools, skills, and a desire to help. Each member works tirelessly to serve our common purpose: to provide an exceptional outdoor remodeling experience with honesty, integrity, quality, and open communication. Our business is based on long lasting, well established relationships. 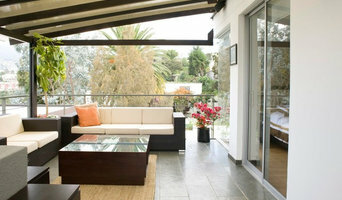 We at Designer Patio build relationships with our customers to ensure we understand their lifestyle and outdoor needs. We provide them with the outdoor solutions and services they need. With a continuous commitment to honesty, fairness, and respect we continue to exceed the expectations of our customers in quality work, professional service and exceptional value. We’re committed to remodeling and to serving you with quality and value. We'll come to you, listen to your needs and wants, and then come back to you with a logical, feasible plan that works for you. Our first-time customers continually become our long term customers time and time again, choosing us for all their outdoor needs. Call us today, and see what our commitment to quality is all about! We may not be related, but you’ll feel like we’re family. Enrique Feldman has created milestones in the recent Caracas architecture and has crossed borders, through his participation in project design both on the island of Aruba and the United States. Nace en Caracas. Arquitecto egresado de la Universidad Simón Bolívar en el año 1982 y realiza su postgrado en el IESA, así como diferentes cursos de Arquitectura en la Universidad de Harvard, Massachussets. Profesor invitado de Diseño Arquitectónico en la Universidad Simón Bolívar. Ha participado en diversos concursos tanto públicos como privados. Sus obras han sido reseñadas en revistas nacionales e internacionales como Spacio & Societa, Arquitectura Hoy, Deco News, Torrecasa y Colegio de Arquitectos entre otras, así como presentadas en Bienales nacionales e internacionales y en exposiciones en el Museo de Bellas Artes de Caracas. Sus proyectos de viviendas unifamiliares y multifamiliares, comerciales, vacacionales y de oficinas, han sido ejecutados por diversas empresas constructoras. La sólida secuencia de ejemplos de su obra, han creado hitos dentro de la arquitectura caraqueña reciente y ha traspasado fronteras, a través de su participación en el diseño de proyectos tanto en la Isla de Aruba como en los Estados Unidos de América. Design-build firms take on the responsibilities of architects, contractors and construction companies, all under one roof. These full-service firms focus on a streamlined design-build process — from the initial design to the estimating phase to physical construction — in the hope of creating an efficient experience for both the client and the company. Because the entire project is happening within one company, Golden Glades design-build firms are able to overlap the design and construction phases of the project, which often speeds up the project significantly. In addition, these firms work to minimize risks for the project owner through single-point responsibility contracts. However, depending on the firm, you may still want to contact an interior designer or architect to help create the exact look you want. Here are some related professionals and vendors to complement the work of design-build firms: Interior Designers & Decorators, Landscape Architects & Landscape Designers, Architects & Building Designers, Photographers. Before deciding on a residential design-and-build company in Golden Glades, FL, think about what you want from your new home. Do you want a large kitchen for entertaining? Do you need several bedrooms for children and guests? Do you want a finished basement for extra space or storage? Look for Golden Glades design-builders that specialize in the areas you're looking for. Budget is obviously a determining factor in the outcome of your project. To make sure you stay within your means, consider making a must-have list and a wish list. Gauge where the estimates are falling to determine which design-build contract can realistically strike the balance between the two. Find a Golden Glades design-build company on Houzz. Narrow your search in the Professionals section of the website to design-build firms in Golden Glades, FL. You may also look through Golden Glades, FL photos to find a pool you like, then contact the design-build firm that created it.